Over the last two decades, mostly from the inception of Giant search engine “Google”, a lot of people and tech gurus are discussing conversion and the term Conversion Rate Optimization is wandering over the web. There are a lot of CRO experts talking about this, however, it’s very unfortunate to see that most of them are misleading and technically, have nothing to with the conversion boost. If you are also searching out for the best tips to improve conversion rates of your landing pages and websites, then here are a few important tips you should keep in mind. Before you start, try out these tips and test them in your particular situation to analyze the results better. Test your call-to-action on the right vs. left side of the page. You have to analyze the call-to-action as per your user behavior to see what works best. List down the top 3 components of your value propositions, and figure out whether they are immediately obvious on your landing page. In order to increase the credibility of your website, do an experiment by adding credibility indicators to your website like- reviews, testimony, awards, stats etc. The Value proposition is highly important as you don’t sell feature, you sell solutions to problems. Make sure that the headline of your landing page matches to the keywords mentioned in your PPC ads. Make an experiment by removing the navigation bar of the landing pages. As the category pages unveil a lot of opportunities, try the list v/s grid view. Test subcategory images versus category images on store pages. Please ensure that your home page provides visitors a self-segmentation to boost the funnel relevance. If your images have the action captions, do include CTA link on it to land the customer on the relevant page. Make an experiment with animation versus static content. Test the performance of forms by embedding the lead generation forms on the page vs. new page vs. pop up form. Swap your website’s left column with right and review the performance. Make your landing page more specific. Drive customers to a product page instead of a category page. Cut down the distraction on your pages. Remove unnecessary links from your pages. Upload larger product images on your category pages to improve the clarity of products. Don’t provide your customers too much product options, it can confuse them. Give them only 1 or two options to choose from. To make your website more readable, increase the clarity with high contrast text on the white background. Get your customers excited because they buy your products emotionally and defend the purchase logically. If you have large blocks of white copy on the dark background, swap it with black text on white. Move the optional form field to the thank you page with the extra benefits for filling them. Replace the rotating offer banners with the static images and also add the value proposition copy. Make an experiment with the call to action from Order Now vs. instant quote vs. get a quote. Test factual approach vs. an emotive one. In this technology driven era, you can’t succeed by relying on just one single technique so keep experimenting with your regular conversion practices. 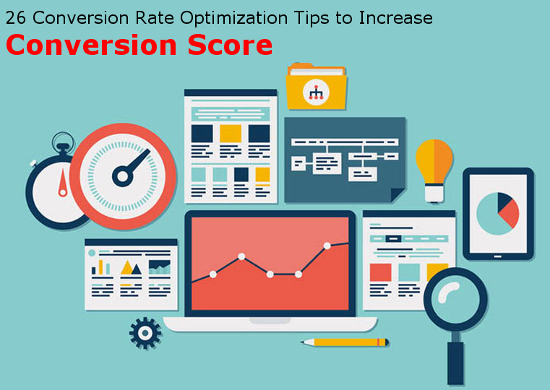 Hope, these conversion rate optimization tips will bestow you with some fruitful results.